In 1923, renowned Russian artist Nicolai Fechin, his wife, Alexandra, and their daughter, Eya, emigrated from Russia to New York City. In 1927, at the invitation of Taos patroness Mabel Dodge Luhan and the encouragement of artist John Young-Hunter, the Fechin family traveled to Taos. After a brief and unhappy stay in "Mabel's Palace," the Fechins decided that it was time for a home of their own. In the early winter of 1927, they acquired the property of Dr. and Mrs. Bergman. The Fechins moved into the house, located on the main street of Taos, Paseo del Pueblo Norte. They lived there until March of 1928 when it was concluded that the two-story, eight-room, cube-shaped symmetrical adobe failed to satisfy their needs functionally or aesthetically and they would have to remodel. For the next five years, the Fechin family labored to make the home theirs. Nicolai planned, and the multi-lingual Alexandra communicated directions to masons from the Taos Pueblo, one of the town's well-known carpenters and a metalsmith. Nicolai worked day and night. The Fechins' workmen removed all interior, non-load bearing walls and reconfigured the space. They doubled the size of the front porch and added a series of rooms that projected from what was once the central cube. ​The construction coincided with the arrival of electricity in Taos in the fall of 1928, and a modern sewage system that arrived in 1930. Electricity made it possible for Nicolai to carve and build at night while he painted during the day. The electric stove, oven and refrigerator were the first in town! With the new sewage system, Fechin went to work installing three new bathrooms. The final result was a 4,000 square-foot, asymmetrical, adobe Pueblo and Mission Revival house, with twenty-four-inch walls. The Fechins created a wonderful home and a masterpiece of Southwest architecture. The spaces within the home were sympathetic to Nicolai's art collections as well as his carvings of sculpture, furniture, and architectural ornament. Despite the massiveness of the walls, Fechin carefully planned window openings. Their locations and shapes were important to accommodate the home's scenic surroundings, including the Sangre de Cristo Mountains under a high sky. 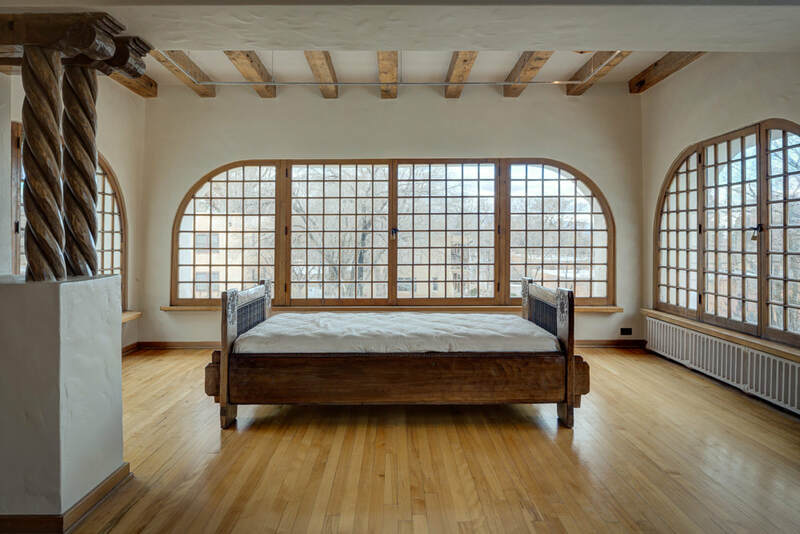 He introduced intense light, which bathed textured "terra bayeta" walls and richly carved wood, into the interior through lancet and arched bay windows of rolled and beveled glass. Working in his father's workshop as a youth provided training for Nicolai as a carver. He absorbed a variety of influences from his Russian heritage and also from his encounters with Native American and Hispanic cultures. He imported sugar pine and poplar from the NW, wood that was easier to carve and mostly knot free to allow for his intricate carvings. He glazed all the wood, creating beautiful undulating surfaces. Armed with mallet and chisel, he began carving columns, stair rails, vigas, doors, and furniture. The wood was then tinted a uniform color with a thinned stain to allow the natural grain to still show. Lastly, each piece was hand waxed to a beautiful sheen. ​With the local metal smith, he fashioned light fixtures, door pulls, and hinges. Nicolai was also a coppersmith: The copper light fixtures and copper hood in the kitchen are of his own making. By 1933, Nicolai and Alexandra, with their workmen, had created one of the most exciting homes in Taos. Eya stated, "A Russian house evolved out of New Mexico mud." Unfortunately, the family's joy was short-lived. The couple experienced marital problems, and Nicolai, with his daughter Eya, left their home in Taos. Alexandra stayed in the house and assumed the responsibility of maintaining the property until her death in 1983. After Eya returned to New Mexico, she accepted responsibility of caring for the house. In 1979, the Fechin House was placed on the National Registry of Historic American Homes and the State of NM Registered Cultural Properties. Living in the studio, Eya created the Fechin Institute and maintained active exhibition and education programs until her death in November 2002. ​The Board of the Taos Art Museum acquired the Fechin property in 2002 and immediately began to renovate the house and studio and landscape the grounds. They provided the house with much-needed repair, installed security and track lighting systems, treated the windows to eliminate harmful ultra-violet rays, and refinished the interior walls and the hardwood floors. On the exterior, the white adobe surface was restored.